Roarprawn reports on yet another waste of tax payers’ money. The Electricity Commission is tendering for an $8 – $10m campaign to persuade us to change to energy efficient light bulbs. When we’re facing 10 years of deficits why isn’t everyone in charge of anything using taxpayers money looking at ways to trim their budgets, and why aren’t they starting with PR? The South Island Index of listed companies shows the recession is taking its toll. Paul Munro, a corporate finance partner in accountancy company Deloitte’s, said the firm’s index of South Island-listed companies had dropped for the first time, slumping 15.2 percent in the September quarter. Most of that drop was during September, as global financial systems started showing serious strain, the South Island companies contracted 15 percent. Over the whole quarter, the South Island index dropped by $676 million to a total market capitalisation of $3.78 billion, while during the same period, the NZX50 index was down just 3.3 percent in the quarter. “Until now the South Island has proven to be relatively well insulated against tightening market conditions in 2008, but we’ve seen this resilience give way,” said Mr Munro. In a tricky and unpredictable market “the volatility and uncertainty has started to bite”. There are signs of slowing in North Otago. A couple of dairy conversions which were planned in our area have been shelved and while there are no signs of panic, farmers I’ve spoken to say they’re being much more conservative in their budgeting than they were a few months ago. 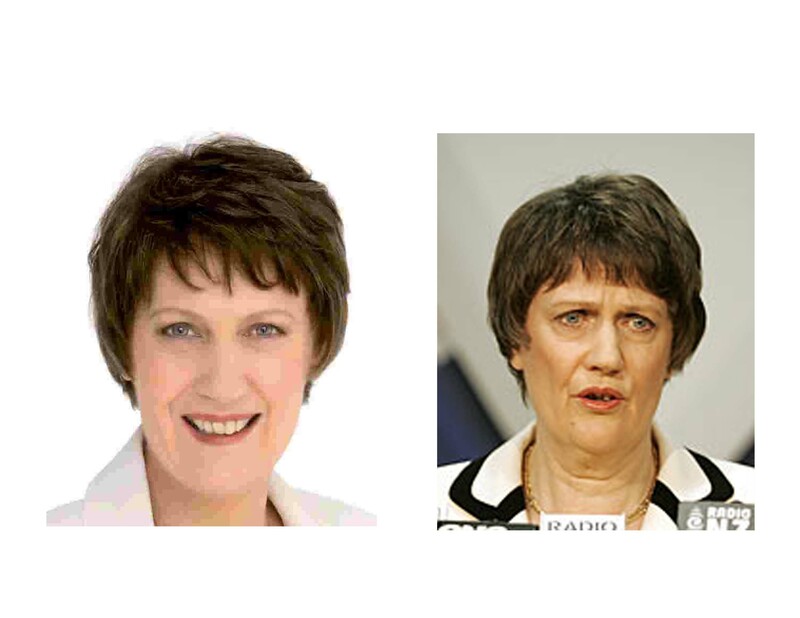 Jamie McKay asked Helen Clark about the billboard photos on the Farming Show today. She said she’s proud of them. How can she be be proud of an image which contrasts so strongly with the real thing when she’s running an election on trust? The Consumer Price Index rose 5.1% in the year to September – the highest it’s been since the year to June 1990. Steep rises in the price of electricity, fuel, food and electricity were the major contributers to the increase. All five subgroups recorded upward contributions to the annual increase, with the most significant contribution coming from the grocery food subgroup (up 12.8 percent). Within this subgroup, higher prices were recorded for cheddar cheese (up 61.6 percent), bread (up 16.5 percent), and fresh milk (up 12.6 percent).The remaining four subgroups recorded the following upward contributions: fruit and vegetables (up 17.9 percent), meat, poultry and fish (up 8.8 percent), restaurant meals and ready-to-eat food (up 6.3 percent), and non-alcoholic beverages (up 6.9 percent). The 61.6% increase in the price of chedder cheese is huge, but when the increase for milk was about a fifth of that (12.6%) it can’t be all blamed on farmers. The ground has started to subtly change around the election campaign and National is the beneficiary. Prime Minister Helen Clark launched Labour’s campaign with a flourish and took the moral high ground on issues surrounding the current global financial crisis. Hers was a plan to cope with the times.
. . . The fact that National Party deputy leader Bill English issued statement after statement asking how Miss Clark would pay for the estimated $1.3 billion of unfunded promises escaped the wider group of voters. It appeared as though Labour was heading on a road to possible victory rather than one of certain defeat as National continued to hover around 51% in the opinion polls compared to Labour lurking around 33%. This column predicted some bold promises would be made on Sunday, thinking particularly of Labour as it continued its spending momentum. But that momentum stalled when Miss Clark at a Wellington rally ruled out making any more spending promises during the campaign.
. . . Across town, at Parliament, Mr Key used his merchant banking experience and finally found the edge he had been searching for on the economy.
. . . Coming out with the policy before the Government could have laid him open to claims of scaremongering and of damaging the economy. Instead, he stayed quiet while his deputy worked away in the background to convince the Government that National was serious in its offer to help. Now it appears as though Labour has run out of steam for policy announcements.
. . . By announcing a move towards a universal student allowance at the start of the campaign, Miss Clark took away a trump card Labour usually leaves until last.
. . . Yesterday, National quietly got on with pushing the buttons it believes will help stabilise its voter support – law and order and elderly care. Mr Key promised to boost police numbers by 600 if his party won the election, with 300 extra frontline officers going to South Auckland. National would spend $18.5 million a year to hire 600 extra officers before the end of 2011. Of those, 220 would be over and above the Labour Government’s planned recruitment programme. Health spokesman Tony Ryall said National would increase access to respite care for those caring for aged family members, increasing support for dedicated respite beds by $5 million a year, funded from within the health sector indicative spending allocation outlined in the Pre-Election Fiscal Update. National also wanted to spend an additional $18 million a year to help rest-homes. Other policies directed at key voter groups – youth, students and business groups – are likely to follow in the remaining days. If Mr Key can hold his nerve, it will be Labour which has to start releasing catch-policies. There’s still 18 days of campaigning left and a lot could happen in that time. But with no money to throw at voters Labour’s left with running a negative campaign. That leaves it in danger of sinking in the mud it’s trying to throw at National. Matthew Hooton and Keeping Stock have rightly highlighted the hypocricy of Labour evading the Electoral Finance Act and the need to spend their own money with their deliveries of this tax payer funded brochure. 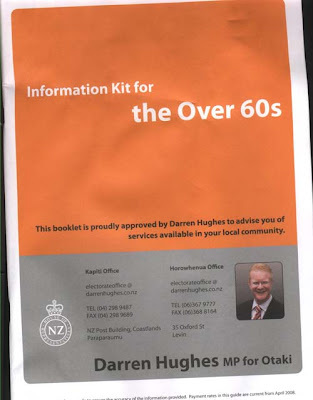 Chief Electoral Officer Robert Peden said he had assessed the booklet, and “it does not contain words or graphics that could be reasonably regarded as encouraging or persuading voters to vote, or not to vote, for a candidate”. Mr Peden said it was part of each MP’s “constituency function” rather than his or her candidacy in the upcoming election. The rest of us may find that difficult to understand because at any time such things are profile raisers for MPs, this close to the election its political intent increases and the name and photo of an MP looks like words and graphics. Kiwiblog says this sort of thing should be banned for 90 days before an election. I agree, although the impact of this particular mail-out on Labour’s vote may not be positive. A friend got a letter from her MP with the brochure which started by talking about older people. She has only just turned 56 so was affronted at the suggestion she was in need of such advice and said that the combination of wasting tax payers’ money and the insult over her age were two good reasons to vote for neither the party nor its candidate. I have found the answer to all those boring political debates and interview programmes (including my own) that litter the election campaign. Don’t have any politicians on them. They become so much more fun if you simply have the journalists nattering to each other and then head off for a beer afterwards. So Frank gave me the idea. If Winston didn’t front then I would have to interview, if not myself, four of Peters’ favourite meerkats. Barry Soper, who Winston had a verbal brawl with in John McCain’s office in Washington, Dom Post investigative journalist Phil Kitchin who broke a series of stories regarding NZ First’s finances that led to Peters angrily calling him a “gripper”, TV3’s Duncan Garner who’s been under fairly constant attack by Peters, and Dom Post gallery journalist Vernon Small who will never be on Winston’s Christmas card list. It was a pity I couldn’t have rounded the panel off with one of the Espiner brothers who Peters loathes with venom.
. . . I regret he didn’t show up but the show went on anyway and everyone had a great time without him. Maybe it was an allegory of the coming election, Winston won’t show up in Parliament because New Zealand First won’t trigger the 5% barrier. Some people might regret his disappearance from the political scene but the show will go on without him and we will all have a great time anyway. You are currently browsing the Homepaddock blog archives for the day Tuesday, October 21st, 2008.